Brady, LOTO Plastic Safety Padlock, 6/PkgBrady, Orange Safety Padlock, 6/Pkg, Item # 51347, Brady® Safety Padlocks are the ultimate locks for safety and security needs. The unique cylinder is insulated to protect workers from shocks when key is inserted. Brady® Safety Padlocks are the ultimate locks for safety and security needs. The unique cylinder is insulated to protect workers from shocks when key is inserted. Padlocks are six-pin precision-machined for more unique key cuts and better tamper resistance. 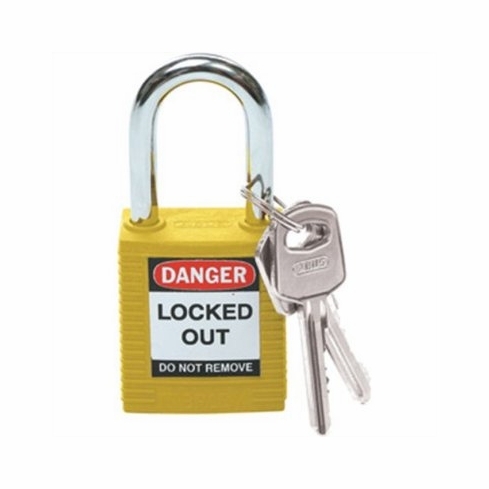 Locks are compact and lightweight plus they resist impact, temperature, chemicals, and corrosion. Their non-conductive, non-sparking bodies feature ribbed designs for easy gripping and handling too. Locks measure 1 3/4"H x 1 1/2"W x 7/8"D with 1 1/2" x 1/4" shackle and come with one key.